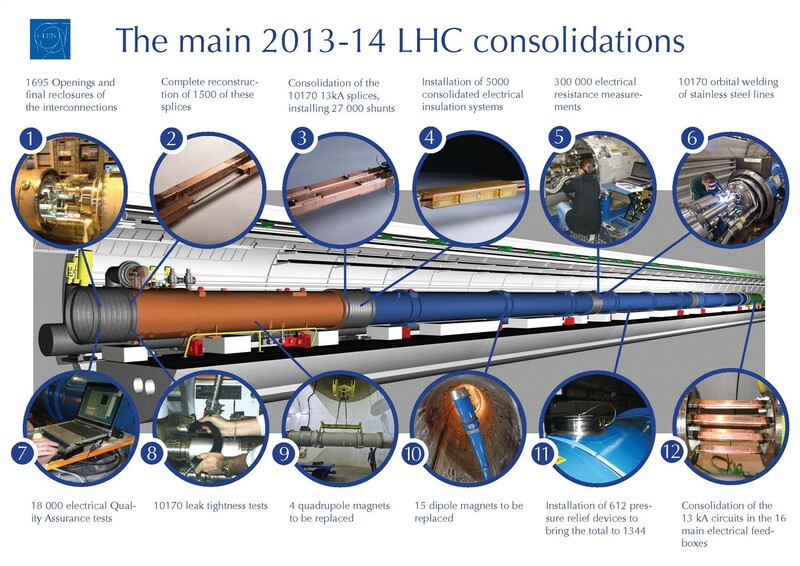 The LHC has ended its three-year long physics run this week and is now finishing off with some quench tests. Tomorrow (Saturday) morning the beams will be dumped for the last time for nearly two years while the collider is upgraded so that it can work at a higher energy of 12.5 – 13 TeV. But the fun is not quite all over yet. In just over two weeks time we should start to see the first of the final results from proton physics run that ended in December 2012. The event to watch is the Electro-Weak section of the Moriond Meeting that opens on the 2nd March. The schedule has not yet been published but when it is you should see it at this link. The following week they will hold the Moriond QCD meeting whose schedule is now available at this link. There will be a quick summary of the Higgs searches which I presume will have already been revealed the week before. What we expect to see is an update for all the Higgs decay channels from both ATLAS and CMS. Remember that we have seen all the results for 5/fb @ 7TeV + 13/fb @ 8TeV, except that CMS choose not to publish the diphoton result because it was smaller than expected. This means that the public values for the diphoton cross-section are currently subject to a selection bias that needs to be put right. The hope is that we will get full results at something like 5/fb @ 7TeV + 20/fb @ 8TeV, In other words we will have 40% more data for most channels and about 75% more for the diphoton channel. We know that all channels other than diphoton are perfectly in line with the standard model Higgs while the diphoton channel cross-section is a bit too large. However, we need to remove the CMS selection bias before we can get excited about it. In addition to the cross-sections we can hope for an update to the tests of spin parity on the Higgs boson. This is the final step required before CERN will be happy to declare that the Higgs-Very-Like-Boson is indeed the Higgs-Boson so that Nobel prizes can be handed out. It is unlikely that the individual results from CMS and ATLAS will be quite sufficient. These tests do not need a 5-sigma significance because they are property measurements rather than discoveries. I think they will settle for 3 or 4 sigmas but this will require the combination of CMS and ATLAS data. The ATLAS and CMS collaborations have had plenty of time to analyse their results and have kept them under wraps with no rumours leaking out yet. This may mean that they are keeping them “blind” until the last-minute. If that is the case it will probably mean that there is not time to do an ATLAS+CMS official combination for Moriond. Unofficial combinations of the channel cross-sections can be done quickly by hand but the spin-parity is more subtle so there will be one final Higgs cliff-hanger until the summer. Normally the biggest HEP conference of the year is either the European EPS-HEP conference or the ICHEP conference. These normally alternate in a two-year cycle but this year an extra ICHEP conference in Switzerland has been laid on. (UPDATE: It turns out that this is not an official ICHEP conference. Same committee appears to be organising over 1000 conferences this year. Do not register, ) The EPS-HEP conference looks legit and will be in Stockholm. Please always check before paying conference fees. 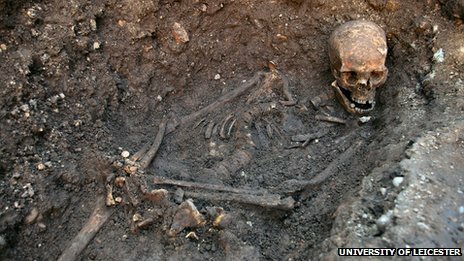 In September I reported on the archaeological excavation in Leicester that had found a skeleton that could be the remains of King Richard 3rd. This morning the teams involved in the dig and the DNA analysis announced that the DNA tests had proven positive and the skeleton was indeed that of the king beyond any reasonable doubt. The DNA test involved isolating mitochondrial DNA from the skeleton. This is DNA found inside the bodies cells in the mitochondria that are used to metabolize nutrients and provide energy. Unlike nuclear DNA this DNA is passed down from the mother only so to compare with the DNA of living people they had to find someone who shared a common female ancestor with King Richard where both lines of descendants are maternal. The final people in the line can be male and luckily one family with living males who could trace their lines was found. If this discovery had been made after their death it might have been impossible to make the DNA test. The skeleton found also showed characteristics of a deformed spine and battle wounds that would have been fatal. This fits historical descriptions of Richard III and his final moments. These historical accounts had not been considered reliable in the past but the discovery of his remains confirms that they were perfectly accurate. Richard III was the last of the Plantagenet monarchs of England from the 15th century so this discovery is very important for English history. His body will now be reinterred at Leicester cathedral. If you are in the UK you can watch a documentary that followed the discovery on channel 4 this evening. Update: I watched the program on channel 4 last night and was a little disappointed that much of the science was glossed over. For example, very little was said about the DNA other than it gave a match. It is a great pity that this was not covered by channel 4’s long running archaeology series “time team” who would have done a much better job of it. The facial reconstruction was shown last night on TV and we be revealed online today. It is notable that the whole project took place because of the insistence of one woman who was an amateur historian. She was refused the necessary grant of £10,000 but managed to raise it privately through the internet. When they first visited the car park there was a space marked with an R which they jokingly thought might mark the spot. It did! You are currently browsing the viXra log blog archives for February, 2013.